I decided to wrap up the unassembled kit and give it to my husband as his ornament gift today. I got exactly the reaction I was hoping for: "This is cool! I wanna do it now!" 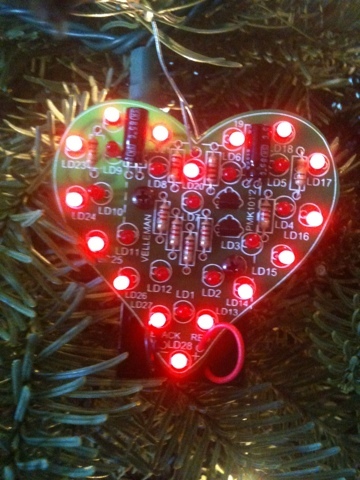 (According to Rodney, this was an "easy" project because of the labeled circuit board. Duh.) Before I could even finish my coffee, he had the soldering iron plugged in. I felt a little bad about taking his new toy away from him, but we decided I would do most of the assembly work. I wondered why the manual didn't just explain it all like this. I suppose they assumed more than a beginner's level of understanding in electronics. Fair enough. I also needed some soldering tips and then I was ready to tackle what just last night seemed like an impossible (for me) project. The kit was just tricky and time consuming enough to hold my attention through to completion. I must admit, all those small parts, the possibility of burning myself and the knowledge that I could mess things up beyond repair made my hands shake, but I felt very empowered by the end. I'm not used to creating for a specific end product, and I had to push through even when I questioned whether it would work once all the components were in place. It helped to have my husband there guiding and encouraging. When we popped on the 9 volt battery and the LEDs actually lit up, the sense of accomplishment after all the effort was huge! Patience, perseverance, attention to detail, a delicate touch and faith that things will work out are all required in understanding the schematics of circuits...and the schematics of love. All good things came out of this. Rodney adores his 2012 ornament, we had the opportunity to bond over his interest and made a meaningful memory out of our ornament exchange tradition. Best of all, I pushed myself out of my comfort zone today and it felt good. "Mila learn," Rodney joked in his best caveman voice.